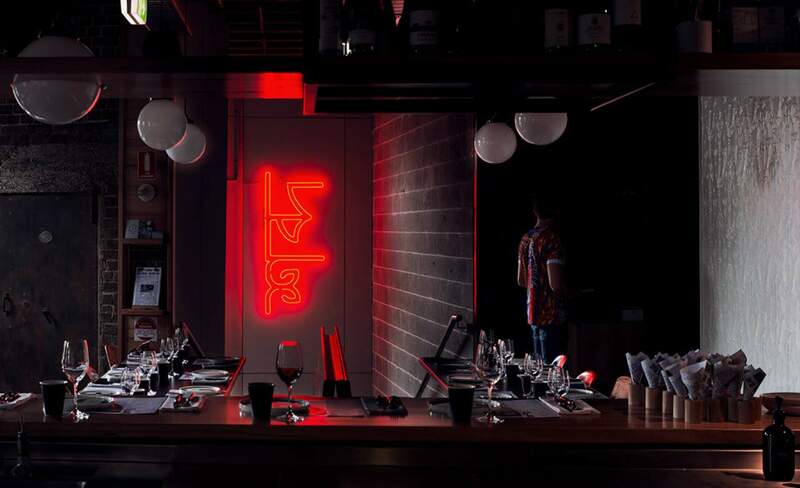 Spiked lassis, '90s R&B and fancied-up Bangladeshi street nosh in Surry Hills. 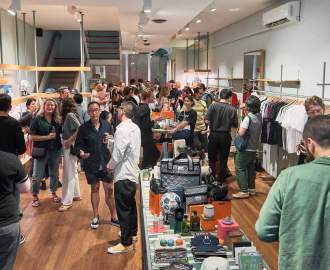 Update: December 17, 2018 — After four years of serving up Bangladeshi street food in Surry Hills, Bang Street Food is closing its doors. The owners made the announcement in an Instagram post saying, "All good things must come to an end... We've absolutely loved every minute and will be forever grateful to our loyal costumers for the support they have shown throughout our journey." There's no word yet on what they'll be doing next — we'll let you know when there is — but the eatery will be holding its final service on Saturday, December 22. So, we recommend making a booking quick smart if you'd like a final round of bhaji and lassis. There's a modern Bangladesh street food-inspired eatery in Surry Hills, but you may have walked straight past it. Opened on Crown Street in January, Bang Street Food has quietly generated a solid crew of returning diners. Run by Bangladesh born and raised head chef Tapos Singha (ex Est, Bills, Lucio's and Gowings), Bang serves up innovative, modern interpretations of traditional Bangladeshi street food to a soundtrack of '90s R&B and hip hop — and they'll even spike your lassi. Hidden behind a blink-and-you'll-miss-it door and up a flight of stairs, Bang is a cosy, exposed-brick-heavy space on Crown; filled with Eames-like chairs, long wooden benches, a bustling open kitchen and plates that spell out the word 'bang'. You've got two dining choices at Bang: eat at the bar or table service. Waitstaff wearing Ed Hardy-like shirts (go with it) will take you through the menu, making solid recommendations with knowledgeable but unpretentious savvy. Be warned though, unless you ask they'll bring everything out at once. But considering the mains, you're probably going to want to dig in asap. Let's get to the food, but let's get one thing clear before we feast. While Bang serves up nosh using the ingredients and techniques particular to Bangladesh street food, this isn't street food the way you might think of it (read: it's not the super cheap snackery you might have had overseas). It's all about interpretation. Singha's nibbles include a little cone of sand-roasted shell peanuts ($2) with all proceeds going to relief aid in Bangladesh — a good starter in multiple ways. Then there's traditional (and almost unshareably delicious) starters like the BANG Bhaji (crunchy, fried, cluster-like fritters with a rich cherry tomato and coconut chutney, $8). Sharing is the way to go at Bang, where you're encouraged to order a few dishes for unified 'food moments'. Plates aren't gargantuan and the food's not exactly cheap, but it's about quality over quantity here (and you won't leave hungry). There's the genuinely moreish duck egg omelette with blue swimmer crab, green chill, grape tomato and garlic chives ($23), or the artfully presented Ora King Salmon bhorta with crème fraiche, mustard oil and wonderfully delicate house pappadams ($22). Follow this with the warming honey-roasted paneer with eschallots and peas ($20), or maybe freshen things up with the delightfully crunchy pomelo salad, with kheera cucumbers, snake beans, grapes, black chickpeas and spiced almonds ($19) — a scraped clean plate disproves the theory that you can't make friends with salad. For the seriously hungry, there's ample feasting to be done on the largest plates — and while we didn't try it, every single staff member suggested the goat curry with chat potatoes and green chilli ($26). Each sitting left no room for dessert, but we're keen to try the rum drunk doughnuts next time — with caramelised peaches, milk powder crumb and saffron crème fraiche ($15); our wildest, most aromatic dreams realised. Featuring an all-Portuguese wine lineup, the drinks menu has been crafted down to the last drop. There's no BYO, but the wines are unique, surprising and worth the mark-up. There's the restaurant's own Bang Pale Ale fronting a local-heavy beer selection. Or for something a little more traditional, there's Bangladesh-inspired cocktails and three straight-up kickass lassis on the table, all available spiked with rum. Rum. We tried the Mango Bazar lassi (spiked, of course) and needed to sit alone in a corner for a moment. So. Good.